GARDEN CITY, Kan. – The No. 11 Seward County volleyball team got back to their winning ways on Wednesday, defeating the Garden City Broncbusters 3-0 (25-21, 25-7, 25-18). The win pushed the Lady Saints to 19-5 overall on the season, while staying a perfect 8-0 in conference play. The Lady Saints hot off to a hot start, taking control of the first set with a 17-10 lead. Giovanna Tapigliani, Djuly Schmorantz, Esmadar Tavares and Luz Sierra combined for twelve of the points, all coming off kills. Despite their large lead, Seward took their foot off the gas, allowing Garden to close the gap to two points late in the set, following a 5-1 run to make it 23-21. 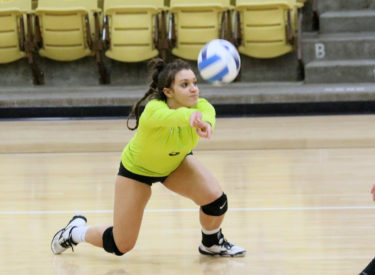 The Broncbusters (0-23, 0-10 KJCCC) were unable to take over the set, however, as the Lady Saints ended the set with a Tapigliani kill and Schmorantz ace, giving them a 25-21 win in the first set. After playing with some lackluster effort to end the first set, the Lady Saints got straight to business in the second, winning 17 of the first 20 points as they held a 17-3 lead. Tapigliani and Schmorantz came away with seven of those points, while the Broncbusters assisted the Lady Saints with multiple attacking errors. Garden used two short runs to push their total up to eight points, but the set was already well in hand with the Lady Saints winning in dominating fashion, 25-8 to go ahead 2-0 in the match. Seward kept their momentum rolling early in the third set, taking a 7-2 lead before the Broncbusters were forced to call a timeout. Coming out of the timeout, Garden used a 5-2 run to cut the lead to two points. The brief hiccup was the closest the Broncbusters would get to the Lady Saints as they pushed their lead to seven points, to the score of 18-11. The lead stayed at seven for the remainder of the set, with Seward winning 25-18 to complete the sweep. It was a complete team effort on Seward’s part, with 11 of the 13 Lady Saints coming away with at least one point. Luz Sierra led Seward with 14 points scored, with 12 coming off kills. Laura De Pra paced the Lady Saints with 33 assists. While Seward came away with just two team blocks on the night, it was an all-time great match by sophomore libero Nathiellen Machado as she came away with 24 digs, one shy of her career-high and the second most digs in a three-set match in Seward history, trailing only Madison Winkelman’s 26 digs against Trinidad State in 2010. Seward will return home on Saturday (Oct. 6) for a 6:30 p.m. match against third-place Hutchinson in the Greenhouse.